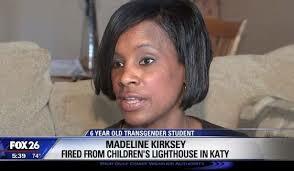 Teachers Fired for Not Addressing Transgender Pupil "Correctly"
Thanks to KRIV, Fox Houston. KPRC-TV reports manager Madeline Kirksey, a Christian author, and Akesha Wyatt were fired from Children’s Lighthouse Learning Center in Katy because they would not recognize a 6-year-old transgender boy. According to the terminated workers, the transgender boy returned to school with short hair as the parents demanded the school call him by his new name. Kirksey said she couldn’t call the transgender boy by his new name because of her religious beliefs. She also felt she needed to protect him from potential bullying and help the other children in the daycare deal with a transgender child. “The folks who are on the front line – the administrators, the bus driver, the teachers – they had a real issue on their hands. Transgenderism is a major and controversial issue for anyone, even adults. This is a little, innocent, 6-year-old child,” Taylor told KPRC. A former Texas educator filed a federal discrimination complaint against a learning center in Katy, Texas, after being fired for refusing to address a 6-year-old girl as a transgender boy. Madeline Kirksey, a former manager of the Children’s Lighthouse Learning Center, was fired on November 3. According to a copy of the complaint, Kirksey refused to treat the child as male and call the child by a male name. Kirksey told ABC News that the parents cut the child’s hair, changed the child’s name and asked the school to respect their decision. Kirksey says she was unable to give her approval to the change in gender identity because of her religious beliefs and was promptly fired. Kirksey and her former co-worker Akesha Wyatt have taken legal action against the school. James Izaks, a spokesman at the corporate headquarters of the Children’s Lighthouse Learning Centers, would not comment on the case out of concern for the student’s privacy. However, he said the company cares about the welfare of its students and did not discriminate against the teachers. He also said he believes the case is part of a bigger national agenda on transgender rights. “It seems to be that this individual has an agenda that goes beyond her students best interest and beyond her termination,” Izaks said. Madeline Kirksey and Akesha Wyatt ran afoul of owners of Children’s Lighthouse Learning Center when they refused the demand from the daycare center and a child’s parents that they refer to a six-year-old girl as a boy. Both were fired, and Houston attorney Andy Taylor is representing them. KPRC television also was present at a press conference on the issue. On another day the little girl yelled that she was a girl when students tried to address her as Johnny, indicating the possible gender confusion that many children experience. The parents were irate that staff had objections to referring to the girl as a male. The manager, Madeline Kirksey, couldn’t bring herself to comply because of her religious views and out of consideration of the best interests for the girl. Andy Taylor is the same attorney who successfully fought all the way to the Texas Supreme Court to give voters the right to vote to overturn Houston’s transgender “bathroom ordinance,” which they did earlier this month. At 6 years old, girls commonly play with boys’ toys. It is called “being a tomboy.” However, for a girl to switch daily from calling herself a girl to calling herself a boy (especially when the parents are an adoptive gay couple), it seems that there potentially might be child abuse occurring.